Austrian police have arrested a father and son who are accused of transporting 600 kg of cocaine on a yacht from Brazil to Europe.The 61-year-old father, from Upper Austria, had spent time in a Croatian prison for fraud, which is where he met a fellow prisoner and drug dealer from the Balkan Escobar clan. When he was released they went into business. He and his 35-year-old son shipped drugs from Brazil to Spain via a catamaran. Last year they received €250,000 for 600 kg of cocaine. However, they were under surveillance by police and were arrested in Steyr (Upper Austria) on Thursday morning. The father and son became the focus of an investigation after a plane carrying 350 kg of cocaine crashed near the border with Brazil and the pilot gave police information about the drug ring. They were in the middle of planning another cocaine smuggling trip. Andreas Holzer, head of the national department for the fight against organized crime, said that the pair had planned to load the cocaine onto a fishing boat in Forteleza, Brazil, and then transfer it to a catamaran waiting off the coast, that was registered in Austria. 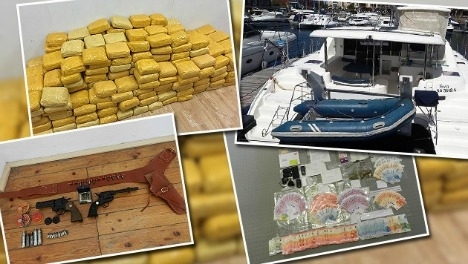 The yacht had a hidden compartment below deck for storing up to 600 kg of the drug. They would then have taken it to Portugal or Spain. “The whole thing was highly complex,” Holzer said. Police said they had been aware of the drug smuggling network since 2013. Since then they have arrested 30 people in Austria and Brazil, and seized cocaine and heroin, millions of dollars worth of cash, expensive cars and dozens of weapons – including two Kalashnikovs.